I knew Scout's 40th birthday was on the horizon, and since she is not only a good friend but also an amazing hand dyer, I decided the most fitting gift would be something knit from her yarn. Because, you know, she doesn't really knit so much any more. Ahem. Knitting is how I met her, though, and even though I had been knitting for six or seven years when we met, she taught me a lot, and the quality of my work improved because of her. Well, if you know her, you won't be surprised that she kind of laughed at my wonky gauge for a while before she insisted that I learn English style knitting in order to produce items that would not swamp their recipients. She was right. What to make? What to make? That was the dilemma. Then I thought about Mary-Heather's Simple Things Shawlette. Scout and Mary-Heather are pals, too, so how fitting, I decided, that she should get a gift made from her pal's pattern. It's warm in New Mexico, but I hope when she needs a little something on her shoulders, she throws this on and knows how much love is in every stitch. What girl can't use a cute pair of shoes? 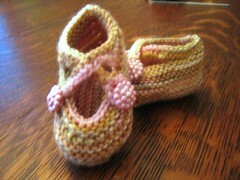 Inspired by Sarah's adorable Saartje's Booties in angora, I made these for a new baby girl. The buttons are my favorite part--I totally want to knit a close fitting cardigan and use the same buttons on it. We've had such a pretty fall weekend here in Connecticut. I hope we have the same weather in Rhinebeck next weekend. Yesterday after I finished up some grading and Neal some renovating, we hopped on our bikes and did a quick 14 miles on our nearby bike path. As much as I feel like I'm in the middle of nowhere in this little town and miss my city life, I am fortunate to have so many great places to play. Neal took Africabike on the path while I rode Trixie Trek, and he fell hard for the fun, fun ride she provides. I think there may be another townie bike in our future. I'm off to do more grading. I reward myself every few papers and after really painful-to-read papers with a few rows of knitting. Hope your Sunday is restful and rewarding, too! I'm usually more of a Guinness girl, but I couldn't resist a little something different. The Clapotis and I had a little bit of a spat. Okay, I got frustrated by knotty yarn and knowing that I could not finish for Rhinebeck unless I gave up, oh, everything else I do day to day. Last weekend I cast on for Dandy using the Green Beer I purchased from Beth at Sugar Spun Yarns. 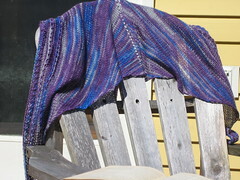 The color had the girls at SnB cooing, and the yarn's springiness has made knitting a pure pleasure. Beth has more of her fabu handspun for sale--she's assured me that the Honey Mustard is from a similar batt and spun just like the Green Beer. I just nabbed a little Candy Corn from her because I discovered over the summer that orange is my new pink. This weekend I'll be back in the grading frenzy. I have a really nice group of students this year, even if the first paper I read had me shouting to Neal lines that were so fraught with meaninglessness that I had to stop for a few sips of Green Beer to relieve the pressure that threatened to make my brain drain from my ears. Also? I'm a little worried about the situation with NASA crashing into the moon. I mean, I know they are smart people and all, but I can't help feeling alarmed, like this is going to set off the plot of a bad Sci-Fi novel. Finally, I'll leave off by saying that I'm thrilled about President Obama winning the 2009 Nobel Peace Prize. The haters may get off on saying that he hasn't done "anything" yet, but I think a reading of the committee's statement makes it clear that the President was an excellent, timely choice for the prize. Enjoy the weekend! I'm looking forward to plowing through my grading and taking those Green Beer breaks regularly! It was either this or a picture of Coco with a Q-tip hanging out of her mouth like a cigarette, a move my cat used to make all the time. Just this week, the pup developed a penchant for Q-tips straight from the bathroom trash. Funny how she was all trained not to be a garbage picker and now she is again. Even funnier is how a tiny little dog can stick things that seem too big for her in her mouth to hide them. Like big chunks of bark. She sneaks them into the house, runs to a safe spot where the big dogs can't reach her and chews away. So, the picture. Taken with George, my iPhone. I saw this tutorial about 15 minutes ago and decided to convert an Old Navy stretchy long-sleeved t-shirt into something more useful. It's cozy, all right, and will be perfect over a tank top while I sip coffee in my pjs on these chilly (I'm NOT complaining) mornings. A second benefit is this: it can act as a mock up of a Featherweight Cardi, which I want to make. I wasn't sure about the style, what with my slim back/large chest figure, but I think it may work. I don't know. I'll keep my new t-cardi on for a while and see how I like it. I do know that I'm all about the sleeves stopping just above my elbows. I better go wash my dishes. I've been avoiding it since I have to wash them in the tub. Having sleeves above my elbows helps. Don't you hate when you have long sleeves that you've pushed up and they roll back down just as you've plunged your arms into the pan of dishwater? Won't be a problem today! Hey, I'm Part of Craft Corps! Check out my Craft Corps story! I'm on the loveseat, the room darkening as the sun sets. Maddie is next to me, and Coco is grunting away in her sleep next to Maddie. Tilly's curled up on the floor. It's a sweet moment. We'll go for a walk in a few and then the evening round of puppy craziness will begin. I did nothing school related today (I lie. I answered a few e-mails.). Hair dresser's, book store, yarn store, bead store, home. Nice little round of errands. I knocked off a little more Christmas shopping and picked up supplies to make a few Puff Daddies and a pair or two of Romi's new earrings. If you plan on making the earrings, and like me, bring the pattern to the bead shop and ask for help selecting supplies, be forewarned that cable thimbles are also called wire guards. I was a bit disappointed in the LBS owner...I showed her a picture, explained what the cable thimbles were meant to do, and she just said she'd never heard of them. As soon as I got home, I logged on to the Rav to find out more, learned their other name, called the shop, and sure enough, she has them. I wish she'd been able to connect the two names to the same items. I will say she was very helpful other than that snafu, but it does mean another trip to the shop. Time to walk the mutts. I'm grateful we didn't get hit by any of the ice that cracked trees and telephone poles just a few miles away from us. Stay warm. 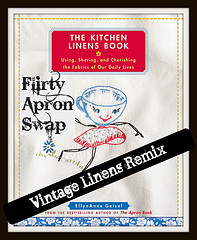 I hope you have a crafty Friday...I'll be back soon with some fabulous swap pictures. Rapunzel, Rapunzel, Let Down Your...Scarf? 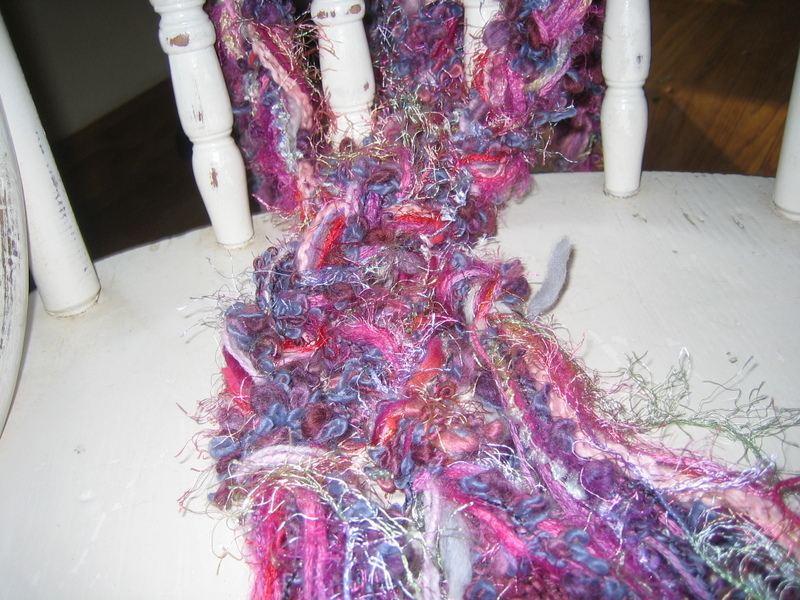 Last year I saw Lolly's luscious Rapunzel scarf, and I've been saving bibs and bobs of yarn ever since. With Neal's help I made three slender braids for a few of the little girls on my gift list. "Rapunzel" is one of my favorite fairy tales, along with the "Little Mermaid," and "Snow White." There are so many others I enjoy, but those three popped right into my head. What fairy tales are among your favorites? We had an adult Christmas yesterday with Neal's family. I like the ones with kids whooping it up all over the place, but little ones are more difficult to come by in our family these days. My first great-niece is due to arrive within the next few weeks, but she'll be in Alabama. I'm hoping her mom and dad will long for the northeast next Christmas. Santa came early this year, but he also left some really lovely gifts in my stocking and under my tree, and even on the hood of my car (it's nice to have a friend in the neighborhood...you never know where you might find a surprise!). Neal liked his gifts, which makes me happy. His sister made our favorite carrot cake, the one she made for our wedding, and Neal scored three-quarters of the cake to bring home. I'm working really hard at not having a slice every time he does, but, man oh man, this is one yummy cake! 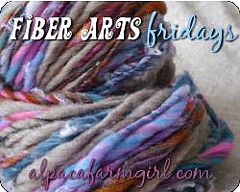 Tomorrow I'll be at the Creative Fibers post-holiday sale. I'm going to try to knit from my stash (again; I failed last year) in 2008, so a few last splurges are in order. 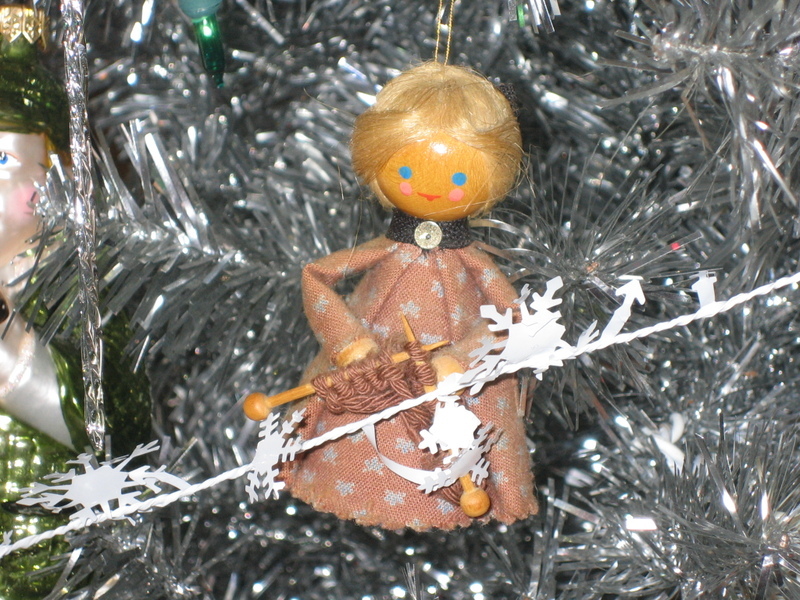 For now, though, I'm going to pick up a languishing lace project and pop It's a Wonderful Life in the vcr. While Neal wrapped my presents, I finished the seaming on this neckwarmer, a gift for my cousin. 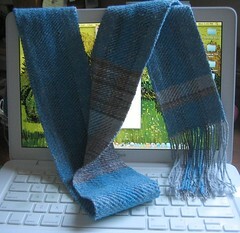 It was a fast knit, and I loved the feel of the Misti Alpaca going through my fingers. I'm going to wrap it up right away; otherwise, I might keep it for myself! I hope you have a joyous and Merry Christmas!